Big box, luxury vacations got you down? If the thought of whiling away another uninspired vacation under an umbrella is less than motivating, you may need to rethink your travel strategy. So what to do? Consider recharging through adventure rather than sloth. Add a dose of adversity, which provides for the possibility of personal growth. But by all means, add levity. After all, this is supposed to be me-time. Here, a trio of offbeat Norwegian hotels where the experience goes beyond 400-count linen sheets and dazzling bathroom amenities. It’s easy to miss Room 47 if you don’t know what you’re looking for. Perched 175 steps down a jetty in the middle of Art Deco-inspired Alesund’s busy harbor, the room does double duty as a circa-1858 lighthouse still in operation. And while the archipelago may be best known as the unofficial adventure capital of the fjords for its spectacular kayaking and hiking, Room 47 may just be its best-kept secret. I first learned about the Molja Lighthouse while cruising on the coastal steamer Hurtigruten a few years ago. As the big ship was docking, a Norwegian friend motioned toward the stout, brick-red lighthouse. “If you love a good storm, that’s the place to stay,” he observed. The first floor of Molja is given over to a meticulously constructed bathroom, where every inch has a purpose and nothing vital is omitted. Heated cement floors ensure guests don’t get a middle-of-the-night surprise, and a front hall has just enough room to hang coats and stow an umbrella. Defying the typical Scandinavian stride, nine narrow stairs lead to the second-floor bedroom. One side of the bed is round to accommodate the lighthouse wall, making it feel larger than its queen size. And, other than a small walking path, most of the room is taken up by the bed. Head and footboard shelves are big enough to drop a purse and a book, and a cleverly planned cubby provides just enough room for a French coffee press and snacks. Like the little engine that could, a beacon pulsates nonstop high above the room, a reminder of the country’s reliance on the North Sea and its myriad islands where predawn boats ferrying workers are speedier than driving the subterranean tunnels connecting the city’s islands. The light, visible through a small glass pane, is only slightly annoying if you stare at it. But the sound of the storm and primo bed ― unfettered with an American-style pillow top ― will have you drowsy at hello. On a recent visit, I awoke early to a typically spectacular Norwegian rainstorm and snapped a few pictures just in time to greet the hotel’s delivery girl before the weather really kicked up. She shoved a basket filled with a thermos of blistering hot coffee, fresh fruit and warm mini-croissants toward me with a smile, wished us a good storm and beat it back to the hotel. In that moment, my wet bags and restless soul became a thing of the past as I took in the smell of salty sea sprays and settled in to watch the storm unfold. Good, I thought. Let it pour. What do you get when you combine great design with down home Norwegian sensibility? The Juvet Landscape Hotel aimed to find out, and what they conjured up is well on its way to becoming one of Scandinavia’s most engaging destinations. Located on Burtigarden, the centuries-old farm along the Geiranger-Trollstigen national tourist route in upper Valldal, the quirky little conclave of cubes on stilts overlooks the Valldola river. It’s so well concealed, in fact, that I almost whizzed by. It was already late in the day when I stopped to watch the waterfall rushing through nearby Gudbrandsjuvet Gorge, and the sun wouldn’t be up much longer. I’d been up early, hiking the paths around the Geiranger fjord, and now clouds were collecting. I longed for quiet. I managed a quick check-in and set out to locate the wooden cube that would be my temporary home. Stark in gray tones, it was perched among other, similar cubes on a low hillside overlooking the river. I strained to count all nine through the birch and pine trees scattered across the hill. Each cube faces the river and has a slightly different shape to accommodate the topography. Curtains are moot despite a full wall of windows facing out, and privacy is spectacular. The interiors have precisely three pieces of furniture: a bed and two lounge chairs. Devoid of ornamentation such as pictures, TV, and even a lamp, the interiors have been stained in a midnight hue. It wasn’t until I was packing up that I realized the built-in alcove was actually a table and two benches. The sauna in the Relax Room was already warm when I arrived, and after jettisoning my bag on the bed, I hiked down for a long soak. As I would later come to realize in my own cube, the full glass wall and dark interiors give an uncanny, and wonderful, sensation that you are sitting outside. The longer you stare, the wider the landscape. The farm is still very much alive, as it has been for centuries. And although the cow byre has been converted into the dining room, the pigsty into the kitchen, and the old hay bridge used to store animal feed into the lounge area, milk production goes on and cultivated land tended. The farmhouse and its out buildings have also been restored, and the delightful, 1,000-year old style of roofing with turf and plants still remains the most effective. “We tried to create a meaningful point between experiencing nature, the cultural history on the farm, and modern architecture to show what Norway is like today,” Slinning explains. Before I left, Knut pulled me aside and asked if I would mind dropping off a fellow guest at the airport when I left. This was when I knew that no matter how far I was from home, someone cared. 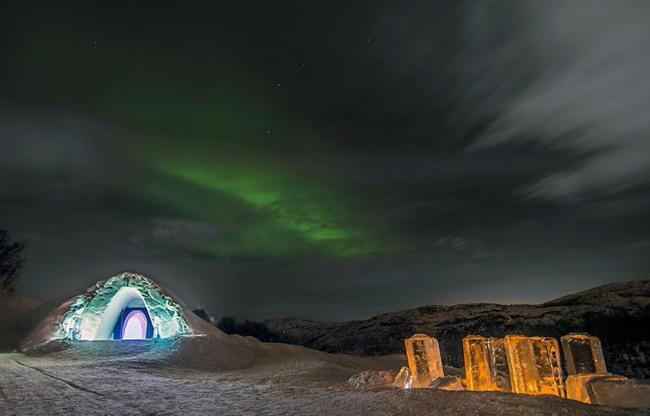 If cold is your thing, the Kirkenes Snow Hotel delivers. Not your typical bricks and mortar construction ― not even a traditional Sami lavuu tent ― the Kirkenes Snow Hotel is one of those experiences that may be better experienced without a lot of forethought. For starters, it’s made of snow. Located near the Russian-Norwegian border in Finnmark County, gasps of surprise are the norm and guests sport heavy down parkas and balaclavas rather than Prada. And when I wasn’t knocking back icy shots of non-alcoholic crowberry glog at the ice bar, I passed the time debating the impact of cold on cellphones with my fellow travelers. Thankfully, the temperature stayed around 25 degrees, warmer than outside. Still, I opted to stuff my phone and camera in the bottom of my sleeping bag and wear the balaclava to bed to maintain my body temperature. According to co-owner Ronny Ostrem, when the weather warms in spring, the hotel simply melts, returning the water back to the neighboring lake in a final farewell to the Norwegian winter. “It’s the world’s greenest hotel,” he winks. If you’re feeling adventurous, the large property hosts activities such as snowshoeing, kick sledding and traditional dog sled rides. I spent the afternoon zipping around on a snowmobile across the salty, frozen fjord where we cut through thick ice to pull out king crab traps, an invasive species in lakes throughout the region. As reward, we warmed up at a cozy cabin in the woods, a well-stoked fire in the middle of the room casting a cozy glow as we wolfed down the freshly cooked crab at farm-style tables. Camping in the snow? Fun. Overnight in a snow hotel? An experience I won’t soon forget.